Drought, combined with the worst heat wave Russia has seen in 130 years, have sparked a devastating outbreak of wildfires across the nation this summer, primarily in the country's western and central regions. According to wire service reports and Russia's Emergency Situations Ministry, as of Aug. 6, 2010, some 558 fires were burning. The fires have killed at least 52 people, destroyed some 2,000 homes and charred more than 1,796 square kilometers (693 square miles). Russia's capital, Moscow, is currently blanketed in a thick smog, which has curtailed activities and disrupted air traffic. According to the Associated Press, levels of carbon monoxide pollution in Moscow are at an all-time high, four times higher than normal. 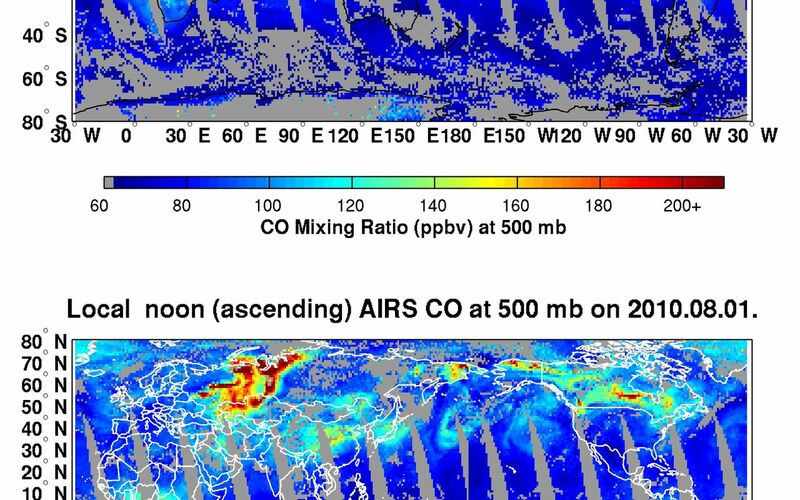 The Atmospheric Infrared Sounder (AIRS) instrument on NASA's Aqua spacecraft is tracking the concentration and transport of carbon monoxide from the Russian fires. 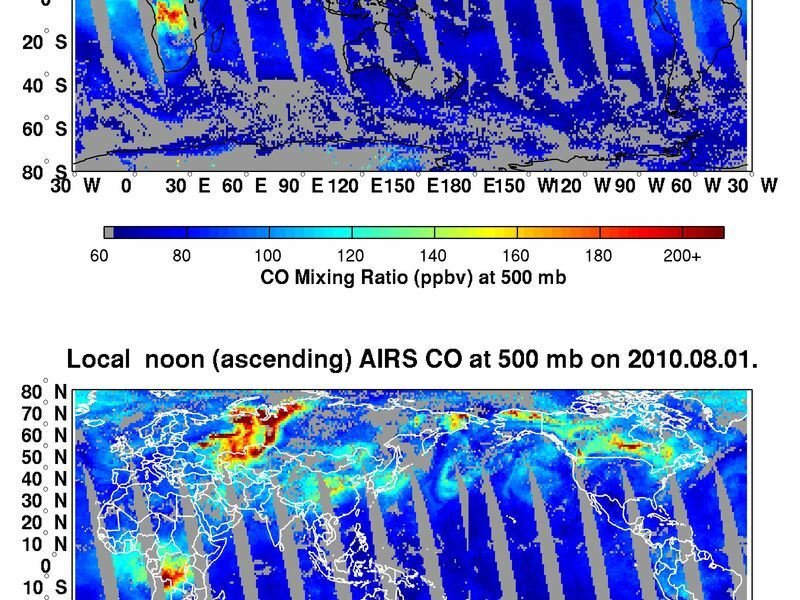 The figures presented here show the abundance of carbon monoxide present in the atmosphere at an altitude of 5.5 kilometers (18,000 feet). 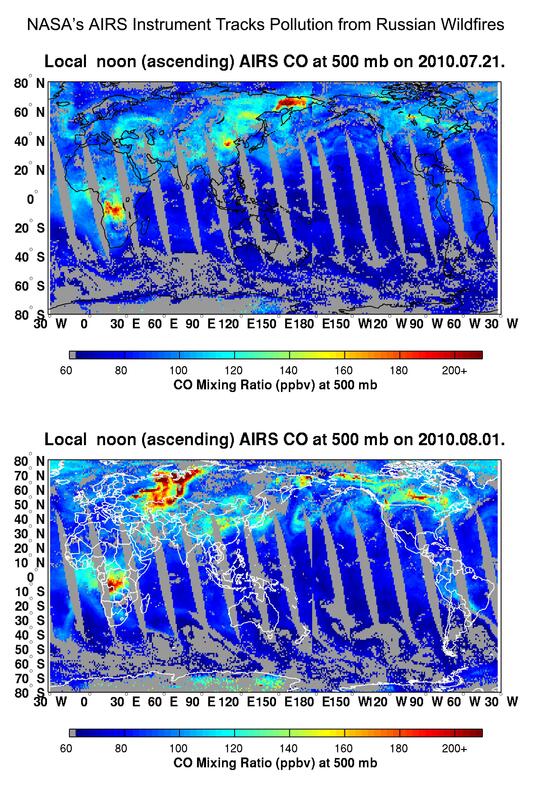 AIRS is sensitive to carbon monoxide in the mid-troposphere at heights between 2 and 10 kilometers (1.2 and 6.2 miles), with a peak sensitivity at an altitude of approximately 5 kilometers (3.1 miles). This region of Earth's atmosphere is also conducive to the long-range transport of the pollution which is lofted to this altitude. 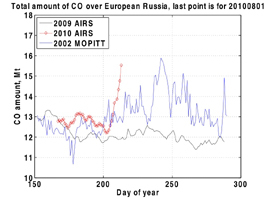 As shown in the top figure in the graphic, acquired July 21, 2010, the concentration of carbon monoxide from the fires on that date was largely limited to the European part of Russia (Western and Central Russia). This contrasts dramatically with the data in bottom figure of the graphic, acquired on August 1, when the carbon monoxide concentration was much higher and the area of the fires had increased significantly. The concentration of carbon monoxide is continuing to grow. 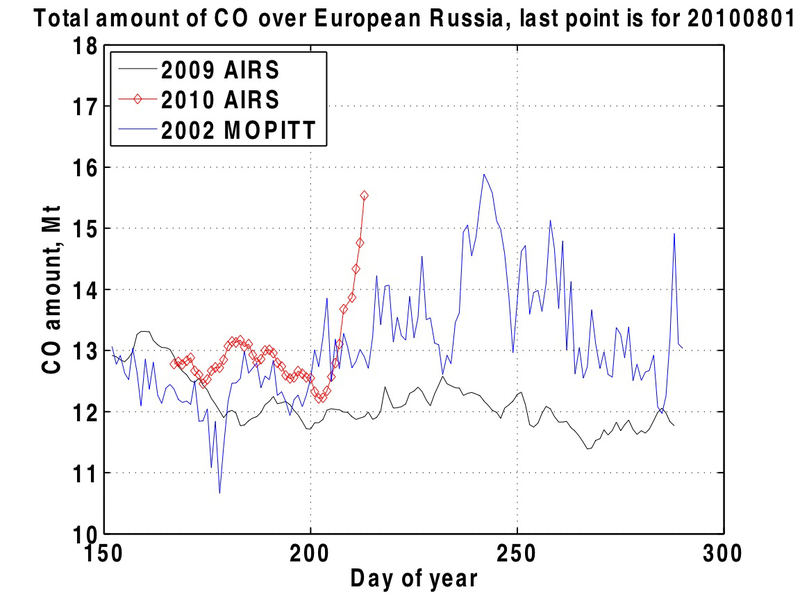 The plotted chart (Figure 1) shows changes in the total amount of carbon monoxide above Western Russia in megatons through August 1, 2010 (shown by the red curve). The changes are plotted again the base year of 2009, which saw normal levels of seasonal carbon monoxide. This is contrasted against the year 2002, when peat fires predominated in Russia and a year for which similar measurements of carbon monoxide are available from the Measurements of Pollution in the Troposphere (MOPITT) instrument on NASA's Terra spacecraft. 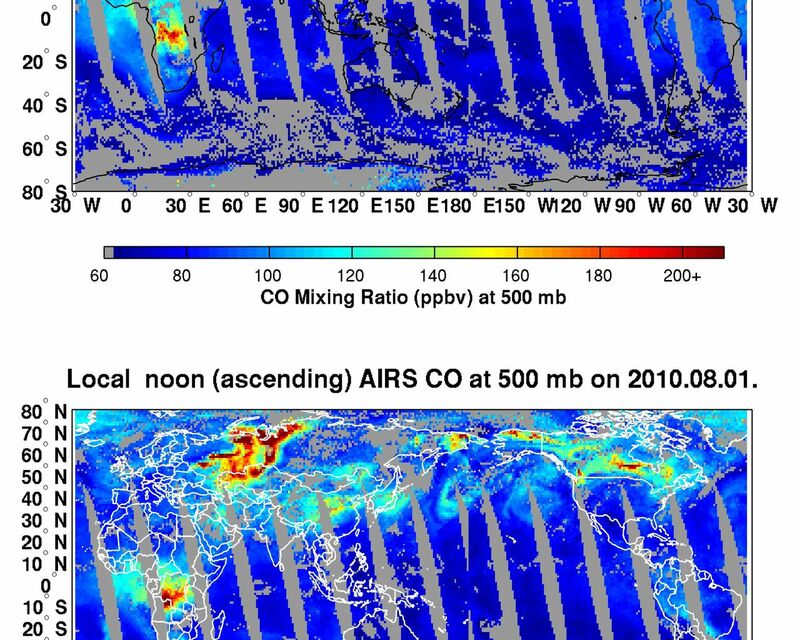 On August 1, 2010, the excess carbon monoxide content almost reached the maximum values seen in 2002. The rate of growth (approximately 0.7 megatons, or 700,000 metric tons, per day) characterizes the rate of emission; the current rate is approximately three times higher than in 2002.